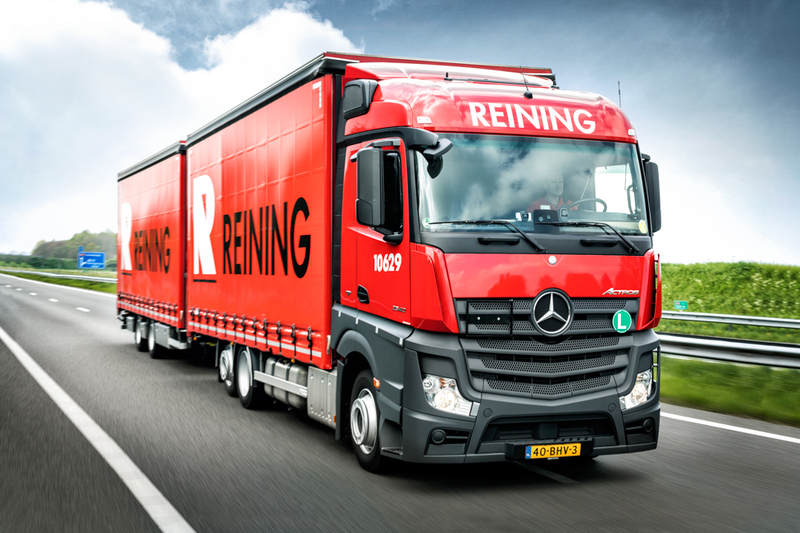 Reining has a large own truck fleet, well-motivated employees and carefully selected partners. By doing so, we have optimal grip on the logistical process and we can guarantee your quality demands. 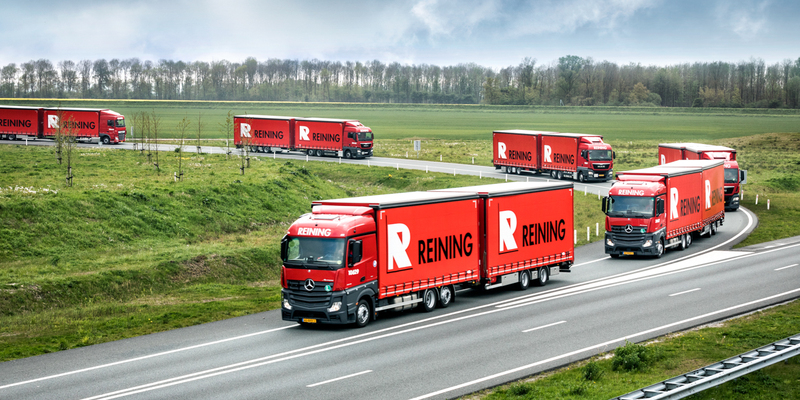 Reining has about 300 road trains with a capacity of 38 euro pallets or 120 cubic meters. They are fitted with curtain sides and are suited for transporting packed goods, also voluminous goods. The special aspect of our vehicles is that they are equipped with an elevating roof. That makes it possible to enlarge the insertion height when loading and unloading. As a result, the full internal height of 3 meters can be used in full, and the vehicle can be loaded and unloaded quickly and without any damage being caused. The vehicles meet the strictest safety standards for securing loads: TüV XL certified.The use of all these facilities gives you the assurance that your cargo is being transported as efficiently as possible. The vehicles can be loaded and unloaded very quickly, which means that our drivers spend very little time at your premises. At Reining the subject of corporate social responsibility is taken very seriously. 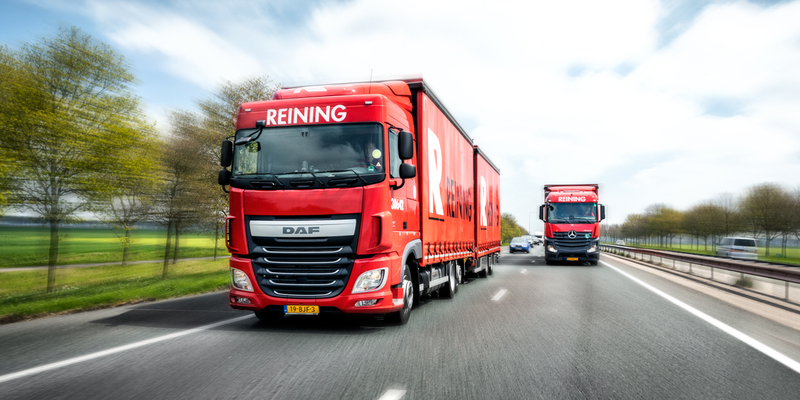 All new vehicles meet the Euro 6 standard and are equipped with particulate filters and painted with environmentally-friendly products. We carry out the transport with our own people and equipment. Our professionalism and scale make it possible for us to react flexibly on your wishes. Our modern Advanced Planning System is an indispensable tool to optimally planning your consignment. We take keeping our promises very seriously. That is why we use modern information technology systems to monitor transport movements. The advanced Transport Management System, linked to GPS onboard computers, keeps us informed at all times of where the vehicles are located so that we can respond rapidly to unforeseen situations. Our information systems are easily linked to our clients’ systems. Service Level Agreements (SLAs) keep our clients informed at all times of mutual performance in the logistics process. The continuous review process guarantees the quality of our service.